The last few days’ sunshine have taken their toll on me and frankly, writing a blog about creatures of the night, when you’re roasting in the sun is rather difficult. A little blog-holiday is what I needed, but now I’m back. Looking for inspiration I turned to my trusted friend the encyclopaedia of animals. If ever there was a creature that resembled a hobgoblin, it’s got to be the Spectral tarsier, although his cousin the Western tarsier comes a close second. Tarsiers belong to the family known as Prosimians, meaning they are classed as primates but are really critters that existed before monkeys showed their faces in evolutionary terms. 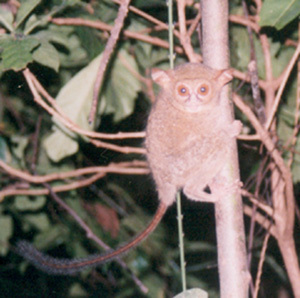 Most scientists today argue that tarsiers should really be classified as a suborder called Haplorhini to which monkeys and certain apes also belong. Tarsiers have huge eyes, just like bush babies, but tarsiers’ eyes cannot move and they lack the light-reflecting disk to enhance their night vision. To make up for this inefficiency of nature, tarsiers can rotate their heads nearly a full circle or 360 degrees, putting a rather literal interpretation on the words “this is making my head spin”. In fact, each eye of a tarsier is bigger than its brain, which perhaps explains the puzzled expression on their strange little faces. As tree-dwellers, they have long, skinny digits, so they can grasp branches better. They have very long, spindly legs and large ears with excellent hearing as well as a long, thing tail to help with navigation when leaping. Tarsiers are tiny, weighing only 165 gr or 6 oz., but they pack a punch when it comes to leaping, which they could easily do for the Olympics. 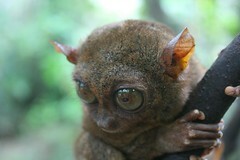 Tarsiers can leap up to 20 feet or 6 m between trees. In the trees they hunt for bats and birds. When on the ground foraging for insects, lizards or snakes tarsiers hop on their hind legs, making them look more than ever like Dobby the Elf (J K Rowling, Harry Potter books). While Willow the Vampire and her friends are unlikely to encounter a tarsier in rural Stinkforthshire, elves and goblins are another matter. 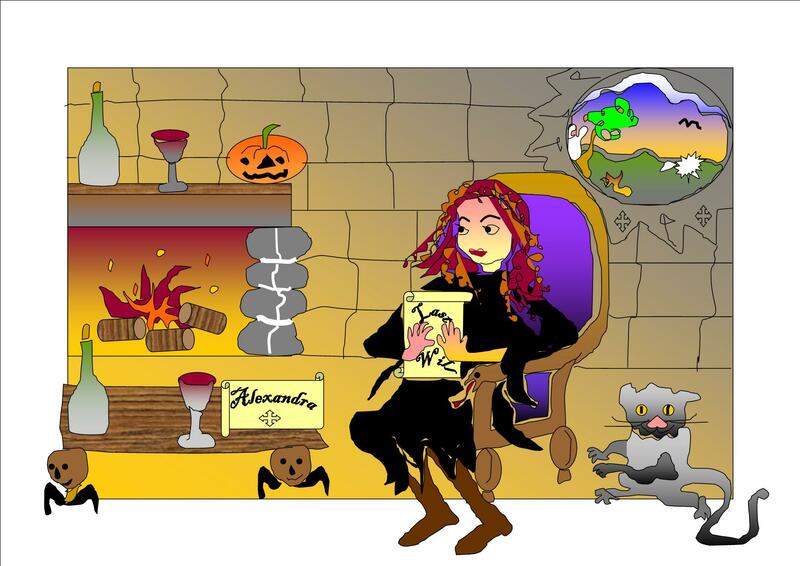 As Willow’s world widens – she is going to be 12 in the next story and therefore more independent – she discovers that humans and vampires share Earth with all manner of natural and supernatural beings, not all of them friendly. Being able to distinguish friend from foe, good characters from bad, is something we hope to learn as we grow up. Some of us are destined to fall for the same tricks time and again, others get wiser with experience and learn from their mistakes. Being taken in by fine words and charming gestures is something we warn our kids about. “Don’t take sweets from strangers” we say to them as they leave for school or the playground, but we rarely follow our own advice. At work or in our social life we often meet goblins and dark elves who charm us with their otherworldliness, their different looks and their flattery. Some of us mean us real harm, see as “sport”, somebody to trick and fool. Others are just mischievous and want to have fun. Either way, we end up getting hurt, when we forget that they might look us straight in the face with those big, innocent eyes of theirs, but their heads can turn all the way round to talk about us disparagingly without us realising. Spectral tarsiers or spectral goblins, either way they are a learning experience for Willow the Vampire to endure. Not all our foes wield swords, fangs and claws. Some make cute twittering noises and flatter their eyelashes at us, before attempting to strangle us with their long fingers and toes. These really are cutie pies – I shall be careful, in case I am fooled by any beasties that are not these little imps, just supernaturals in disguise. Today, I shall be on the look out for all manner of trolls and elves. So you’ve seen them too! Yes, particularly at that supermarket chain which buys up all the council land to stop others from building something useful on it.